Installation of these detectors for scanning containers was a major recommendation for security at important ports. KOCHI: To enhance security measures and prevent the shipment and smuggling of hazardous materials into the country, the Port management will install advanced radioactive material detectors at the soon-to-be commissioned Vallarpadam International Container Transshipment Terminal (ICTT). The installation of radioactive material detectors and X-ray machines for scanning containers was a major recommendation made by the high-power committee constituted to review security at major ports, which was headed by Cochin Port Trust Chairman N Ramachandran. As per the recommendations by the committee, the Union Government in April last year had asked all 12 major ports to install the devices. The devices are being prepared by the Electronics Corporation of India (ECIL). The detector procurement process is in progress. This advanced system is being introduced as per the Safe Port Agreement with the United States. 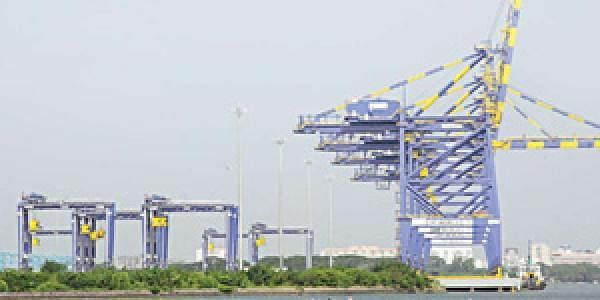 According to the agreement, the security system need to be implemented by March 2012,” Cochin Port Trust Chairman N Ramachandran said. “The recommendation to install radioactive material detectors does not mean that smuggling of such materials is going on through Indian ports. It is a precaution against possible threats in the future,” he said. Around one million TEU containers will be handled at the ICTT in the first phase. The detector will raise alarm when a container carrying highly radioactive materials pass through it. “All the containers moving to and from the ports will be scanned with the detectors. Once installed, the detectors will have a crucial role in ensuring security at ports. Our government-owned organisations have the technical knowledge to develop such a detector,” Ramachandran said. Most of the major ports in the country, except the Jawaharlal Nehru Port Trust (JNPT), lack such scanners, making it difficult to check container traffic.